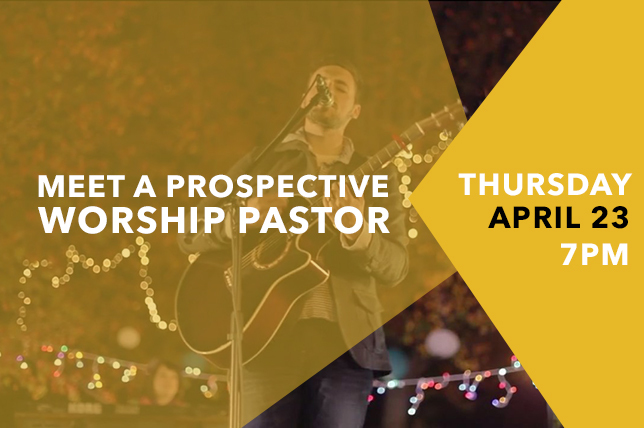 I hope you are planning to join us for a great night of worship on Thursday, April 23, led by a prospective Contemporary Worship Pastor that we want you to meet. The service will be at 7:00 p.m. in our Multi-Purpose Gym, and childcare is provided for birth through age four. I suggest that you park on the east side of our campus and enter through the main Worship Center entrance or through the Family Life Building. Here’s a bit more about our guest worship leader. He is in his late 20s, married, and has two preschoolers. He is a native Georgian, and has served since 2013 as the Worship Pastor of a Georgia Baptist church with about 500 worshipers. He has a Bachelor of Arts degree in Music (2010), with specialties in guitar and voice. Prior to his current position, he traveled with a band and led worship in churches and other venues across the country. He also has experience helping develop worship leadership teams in a couple of church plants. Of course, our consideration of a Contemporary Worship Pastor for our team is with a view toward launching a fourth Sunday morning service. The “musical heart language” of that service would be guitar-led, band-driven, with a vocalist or two. The song choices would typically be more contemporary. The teaching in each service would be the same, but in the contemporary service it would typically be by video. As the Apostle Paul wrote, we “do it all for the sake of the gospel” (1 Corinthians 9:23, ESV). The goal is more “spirit and truth” worshipers who become fully-devoted disciples of Jesus Christ – all for the glory of God! I hope to see you on Thursday night, April 23!